The IWM's Great War Centenary has a wonderful blog post with audio about the bitter winter of 1916-17. This is the same winter pictured in the photo of men having Christmas dinner in a shell hole in my last post. The photo appears at the bottom of the Centenary's blog post, along with many other vivid illustrations and artifacts from this truly dreadful winter. I've just found the new World War One Discovery Programme, which gathers online WWI resources from all over. A phenomenal resource. 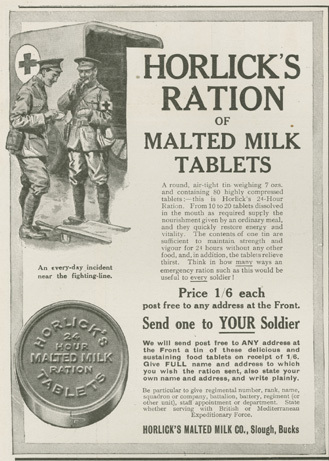 Oxford's World War I Centenary Programme has an informative blog about WWI-related events and resources (mostly in the UK). A soldier on leave at Epsom, 1914. © IWM, Item Q 53560. It's December 19th and Christmas is less than a week away! Last year at this point, I was writing about the famous 1914 Christmas Truce and about gifts for soldiers, like the Princess Mary's Gift Box. Both of these phenomena reflect the crossing of significant barriers or divides, whether that which lay between one side and the other on the battlefield or between home and front. A wartime Christmas mediated such boundaries in many ways. Christmas was a time to set aside differences, in the case of the truce, which was said to involve games of football, solemn reflections, and food and gift exchanges. It was also a particularly meaningful time for civilians to connect with troops. A.W. Ford & Co. ,"Buy a Christmas Present for Your Soldier Friend,"
ca. 1914-18. © IWM, Item PST 10797. "Christmas Puddings for Soldiers and Sailors," ca. 1914-18. © IWM, Item PST 10793. Christmas dinner in a shell-hole, 1916. © IWM, Item Q1630. I can't tell whether the group in the above photo are dining in the company of a grave (marked by the mound of gravel and wooden cross?). It certainly appears so. As I noted in my previous post about wartime theatre, many festivities on the front had to confront severe circumstances or limitations in achieving their various illusions. Regardless of whether my suspicion about the photo here is correct, the soldiers pictured are participating in a kind of theater of their own, replicating as closely as possible a festive meal shared between loved ones who are gathered specially for the occasion. Given the grim necessity of eating a surely modest supper whilst assembled in a blasted crater and possibly in the company of a dead comrade, the distance between the real and the imagined or fancifully replicated is clear, though the effort to bridge this divide is moving. That the men keep their helmets on throughout this meal suggests that while their meal may represent a respite from the everyday reality of war, very serious danger persists. It is possible, of course, that there is no attempt to erase the battlefield here. The soldiers may well be embracing their prevailing reality (especially given their chronologically and psychologically entrenched position in the disastrous midle years of the war), with the nod to holiday tradition a somewhat farcical performance that can only highlight the impossible distance between themselves and a pre-war era or a civilian world. "Christmas in Wartime," ca. 1915. © IWM, Item PST 1074. A khaki-clad Father Christmas sits atop the great performance venue in this poster, welcoming all to attend the fundraising event, though also reminding them of the war's heavy burden on the nation, especially at the holidays. Whether at home or on the front, Britons were well aware of Christmas's symbolic power, which in no small way was/is tied to its theatricality--its ability to represent and permit the kind of joy, peace, or communal celebration that we wish for all year round. Our participation in Christmas festivities is a way of participating in a performance--an enactment of the happy things that we want to be true or real on more than just one day out of every three hundred sixty-five (which might explain my need to set up our Christmas tree and start listening to holiday music right after Thanksgiving this year!). Nearly a century ago, our ghosts of 1914 must have longed for the normalcy of Christmas's usual illusions. Their attempts to cross the divides of war and home or wartime and peacetime evince these heartfelt holiday wishes. I hope you've enjoyed this first set of images and musings under our Great War Christmas tree this year. I'll be back with more holiday goodies leading up to the big day next week! "Our Day" Poster, India, 1917. © IWM, Item PST 12592. Another almost-Christmas post for my readers today. I found this interesting poster in the IWM Collections Database this morning whilst looking for holiday-related items. It was, I discovered, a timely find. Almost exactly 95 years ago, the Red Cross's "Our Day" celebrations took place in India. I managed to locate this digitized newspaper article (oh, how I love the internet!) about the festivities at the National Library of Australia's website. On December 13th, 1917, the Sydney Morning Herald reported that, all across India on the 12th, a fundraising effort and various Imperial huzzahs (marked by Union Jack "buttonholes," lovingly circulated "portraits of Their Majesties," etc.) were raised. "Our Day" Poster, 1917, India. © IWM, Item PST 12590. "Our Day" poster, South Africa, ca. 1917 (?). © IWM, Item PST 12337. In prior years, the Red Cross had organized "Our Day" campaigns, though all indications are that 1917 was the first and/or only year of India's participation. The posters' imagery suggests an effort to make or find order amongst the chaos of the battlefield. Angelic or benevolent figures represent the Red Cross's hopeful, helpful, presence amid the pain and struggle of soldiers. The bright white light in the South African poster or the nurse's crisp apron are depicted rising above strife and focus our attention within each image. The first poster (at top) is the least similar in its imagery, though its promise that the funds collected will go primarily to the "men fighting in Mesopotamia" is supported by the various sketches of soldiers in action. If you are moved to remember soldiers' and/or their families this holiday season, you might check out my earlier posts about service or contribution opportunities among several well-respected charities in the U.S. and Britain. For more about India's role in the Great War, take a look at earlier writings in the "India in Flanders Field" series here on "Ghosts of 1914." Next time we'll get into the holiday spirit and begin honoring Christmas with the ghosts of 1914. To my readers celebrating Hanukkah, may you enjoy the last weekend of the festivities. December will be a month of festivities here at "Ghosts of 1914." While we will, of course, be looking at December holidays, I wanted to start us off with a brief consideration of some other kinds of festivities. Included in that category are the many, many, theatrical performances and events that were so vividly a part of Great War experience at home and on the front. Canadian performers (including a female impersonator) getting ready for a show, 1917. © IWM, Item CO 2013. Theater was an important aspect of the war--entertainment for troops and civilians was an important cultural space or experience in which relaxation, pleasure, and a bit of escapism were possible. As the above photo of a Canadian performer preparing to play a female character (because women would not have been present on the front) shows us, wartime theater often worked within many limitations to achieve its illusions. While doing research on British P.O.W. camps, for instance, I discovered that imprisoned soldiers frequently participated in light-hearted theatrical shows or other entertainments. The disparity between such momentary fantasy and the horrible gravitas of a prisoner's typical existence is quite moving. Despite (or perhaps because of) grim circumstances and daily oppression, prisoners of war from many nations embraced the opportunity to set reality aside and don costumes, sing or dance, and play dramatic roles. There were politically-motivated theatrical events for P.O.W.s too. A pamphlet or flier in the IWM collection represents a German P.O.W. "production of music, recitations, and a lecture" all about William Shakespeare at a camp on the Isle of Man. Nellie Isaac, "At a Performance in the Canteen Theatre," ca. 1914-18. © IWM, Item ART 2318. "The Shrapnels," 1915. © IWM, Item PST 13752. "The Merry Magnets," 1918. © IWM, Item PST 13757. "Floral Fete and Carnival," 1918. © IWM, Item PST 5486. Thank you for joining us for this little exploration of one of the many scenes that played out on the stage of Great War history! Stay tuned for holiday-themed posts next time at Ghosts of 1914. 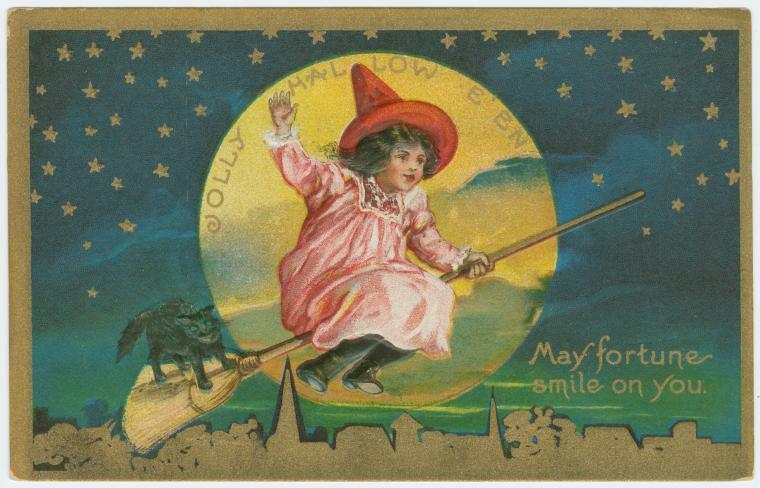 "A Jolly Hallow-e'en" Vintage Postcard, ca. 1910. © NY Public Library Picture Collection. Winifred M. Letts's Hallow-e'en and Poems of the War is widely available online for those of you would like to delve a bit into Halloween and Great War history. 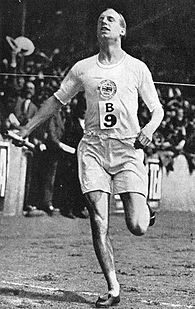 Letts, born in 1882, was of English and Irish heritage. She was also a versatile writer, penning novels, poems, plays, and children's fiction over her career. The Halloween-themed poems in Letts's collection are touching, rather tragic, musings. They offer an older-world vision of Halloween as a holiday when the spirits of the dead might return to familiar places and people. "Hallow-e'en 1915," for example, is an emotional appeal to the war dead, hoping that they will be drawn by the welcoming lights of home. Hearth fires, stars, lanterns, and lamps are all described as beacons for the "well-beloved dead." Other pieces of note in this great collection are "The Deserter," a well-known piece that considers the plight of those too fearful to fight, and "A Sister in a Military Hospital," about nurses much like those whose uniforms might inspire a costume or two, as I have written previously. Letts's book connects Halloween to the First World War in an unexpected way, offering a different perspective on the holiday than the one we might know today. In her poems, mingling with ghosts on "Hallow-e'en" is a longed-for reunion rather than a spooky thrill. Most importantly, however, Halloween is for Letts, as it remains today, a time of possibilities, a brief night when real and unreal can come together and a slightly different, more magical, world appears. Today I'm celebrating the first birthday of Ghosts of 1914! I'm delighted to have kept the wheels turning on our journey into Great War history. Thank you for joining me along the way! Jeanne Lanvin. Robe de Style, 1924-25. © Metropolitan Museum, New York. Mairi Chisholm (? ), Nurse, ca. 1914-18. © NLS, Acc 8006 (i). Mairi Chisholm and Elsie Knocker were, according to the National Library (NLS), the only two women permitted to serve on any Western Front battlefield. 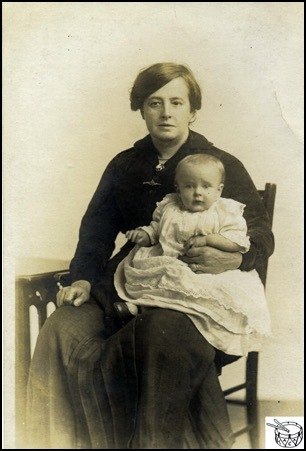 Explore the NLS's "Women in the First World War" learning site to find more details about these remarkable ladies and some of their peers. As for a Halloween costume, Mairi's trench coat and waders/high boots, as well as her messenger bag and helmet, could be replicated with modern finds and would make for a really exciting innovation on the standard nurse's uniform. Well, I'll close for now, but there are a couple of ideas for Great War-inspired costumes that can easily be constructed out of items you may have in your own closet or that can be found at the local thrift store, army/navy supply, borrowed, or purchased inexpensively elsewhere. For more on First World War costumes, take a look at my earlier posts on this topic. And, I will be back to suggest even more ideas before the big holiday arrives! Because yours truly just finished her dissertation, it is now time for me to look for a job! If you are in need of a writer, museum assistant, editor, researcher, teacher, or publishing associate, please let me know! I am back from the time warp that was submitting and shipping my dissertation! What a whirlwind the last month has been. And there's no rest for the weary. Between a short-term writing gig and some other projects and what-not these days, I am a busy little bee. I just wanted to pop in here to let you know that, though I may have finished the biggest academic project I've yet done, a culmination of the ten or so years I've spent thinking about and working on the First World War since college, the Ghosts of 1914 are still with us--and me. In the days after I turned in the dissertation, when everyone was saying, "you must be so relieved!" and "now it's time for a rest!" I'd nod, smile, and then think, "I sure wish I felt relieved and/or restful..." There are reasons for my lack of celebratory insouciance. Of course, handing in a dissertation is not the end of that particular process--there are numerous reviews that must take place before a degree is awarded. Waiting is the name of the game now. And, like many young academics in my position, I'm at a point between education and career when the next (professional) chapter is yet to be written and leaving the safe, structured, world of grad school (though it has its tribulations, of course) is thus a difficult prospect. Finally, the truth of having "finished" the last and most pivotal requirement of graduate school takes a long time to sink in. Anyway, when one is at such a crossroads, it can be tempting to look, with a sudden flash of gleeful spite, at the books and papers that have set up shop in one's home and life--on desks, bookshelves, floors, bookbags, etc.--over the last several years and begin gathering, flinging, discarding, banishing...you get the idea. I've known the pleasure of returning literally hundreds of library books and throwing out old drafts, and I've imposed mental quarantines forbidding certain authors or topics at such moments in the past. However, I haven't really felt this urge this time around. Perhaps it's all still too new. But, I think there's another--better--reason. When I look at my bookshelves, I realize that my copies of Virginia Woolf, Lytton Strachey, Vera Brittain, Siegfried Sassoon, Helen Zenna Smith, Sir Arthur Conan Doyle, and so many others are old friends. Furthermore, I am still curious about so much of Great War history, culture, and arts. I still have so many questions and I can sense that there are so many stories that still need to be recovered from this moment in time. While the climb was burdensome at times, I've gotten to the top of Dissertation Mountain and I can say that the view is dazzling. It's not entirely clear what all lies before me, but I do know that there is much more to explore. I've got WWI projects already up my sleeve, to be sure--more research I'd like to do, more writing (both academic and non-) I will do. And Ghosts of 1914 is definitely here to stay. This blog has been a delight and a source of support during the last year. Here, I've had the joy of pursuing detours and by-roads in WWI history and knowing that a community of readers joins me in my explorations. Thank you for reading and do stay tuned. In the next weeks, I'll celebrate the first birthday of Ghosts of 1914 with plenty of new posts. It's good to be back. I am quite busy these days with dissertation writing. The good news is that I have, technically, written all of the chapters. The less than wonderful news is that I have a lot of revisions to finish. And that means that the next several weeks will be spent, in large part, obsessing about Virginia Woolf, Lytton Strachey, Vera Brittain, Siegfried Sassoon, and their literary friends and relations. When I feel overwhelmed at having to climb--or keep climbing--what I call Dissertation Mountain, I just think of myself as Issa's snail, tracing one little silvery dash behind him at a time. Mount Fuji can be climbed, even if slowly. And so can Dissertation Mountain. Another thing I do when I feel overwhelmed or disenchanted with this mountain of my making is to watch movies that have to do with my subject(s) or their time period while I work. It helps immensely to have the pleasant, undemanding, company of a familiar film while one types, deletes, has revelations, despairs, and returns to typing once again. 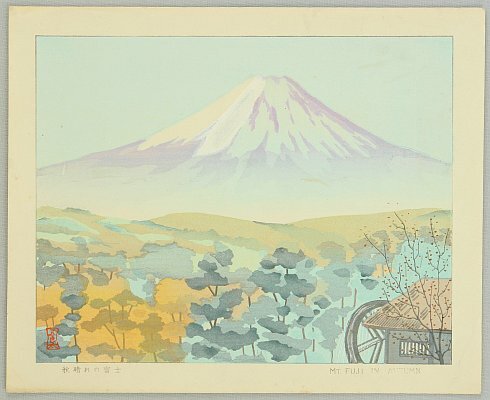 One letter, one word on the blank page at a time, a veritable and virtual Mount Fuji slowly covered with the silvery snail tracks of my writing. The most important thing is to keep going! My film of choice right now is one of my all-time favorites. I've been in love with it since I first saw it over ten years ago, as part of a spectacular Bloomsbury art show at the Yale Center for British Art. I've watched it time and again and even used it in a course I taught at Yale about Bohemians in literature from Shakespeare to Kerouac. It is Carrington. 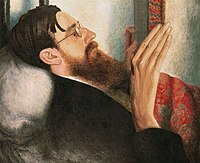 Now, Michael Holroyd's Lytton Strachey and Gretchen Gerzina's Dora Carrington: A Life offer many more details than any film could provide about the lives of the two incredible figures portrayed. However, if you are a Bloomsbury fan, a twentieth-century enthusiast, a (secret) Bohemian, a fashion history person, a literature and/or art scholar, or a period drama film-lover, then do watch this movie. I recall being annoyed when my own copy of Holroyd's Strachey arrived a few years ago, with the image of the film's stars as Strachey and Carrington emblazoned on its cover. As a rule, I do not approve of film posters as book covers or endorsements from modern authors on classic texts (among other things). But, much as I might not have liked receiving the Carrington-decorated copy of this beautiful biography, I do love this film. There are many reasons why I enjoy it so much. Sparing myself (and you) from too many of them, it's one of my favorites because it is about real people, an era, and art and writing in which I'm interested and, more broadly, because it's about human relationships that defy standard categories but are defined--wildly and genuinely--by love. Enough, already. I must pack up this little encampment and seek higher ground on Dissertation Mountain. I hope you enjoy the film, the two biographies, or, if you are a fellow graduate student or writer or anyone with a mountain-like project in front of you, I hope that you can be inspired to keep climbing--but slowly, slowly! I've been dreaming of the silver screen lately, and I wanted to compile an initial list of essential films about the First World War. There are lots, of course, and many movies feature unexpected links between a primary storyline and the war. Perhaps because I spend so much time reading and writing about the war, these links pop out at me--sometimes surprising me in films I've seen many times before. For instance, the 1992 Chaplin, a favorite of mine for several reasons, includes a phase of the silent star's life when, as he travels in Britain after the war, the relevance of his art is questioned in light of the devastation that his native country has experienced. Chaplin actually made a war "comedy" in 1918, called Shoulder Arms, about which Chris Edwards writes quite eloquently at his blog, Silent Volume. I have not seen the film, but Edwards writes that the Little Tramp character enlists in the American army. Perhaps this alignment, though surely stemming from Chaplin's association with American film studios, allows the film's (strangely chosen) comedy to avoid representational contact with British experience of the war. Though comedy was not an unknown note in this experience or its expression, it is true that the film may strike viewers as odd or somewhat disorienting in its unreal depictions. Here are ten films, to start. These are my personal picks for today, not all well-known or widely-recognized as war films, but the ghosts of 1914 haunt them nonetheless. Sometimes the most moving encounters with the Great War on film are not in movies directly about the war, after all. 1. J'Accuse (1919) Clips from this incredible film can be found here. I hope you enjoy watching or remembering some of these films. 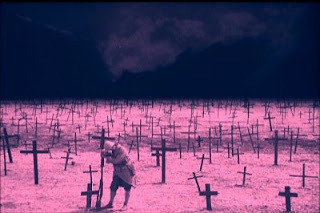 Take a moment to consider the ways in which the ghosts of 1914 appear in these and other movies--at times manifesting right before our eyes, and at others, hovering at the edges of the screen. A quick post to mention our slightly spruced up look, now with a title block of images from the fantastic "Photos of the Great War" World War One Image Archive. The archive features public domain photographs depicting many aspects of the Great War, from battlefields to troops of various nations, to iconic military figures. Take some time to explore this wonderful archive, which features historic documents as well. Occasionally, I will change the header images to show more of the ghosts of 1914.